It's March 1st, I'm so happy that spring is within sight. I don't do winter, I hate cold and snow and rain and dark days, I grew up in Montana and it's cold about 8 months out of the year there so I pretty much spent my entire childhood being cold. I moved to Seattle to get away from the snow but now I don't see the sun for 10 months out of the year, can't win, I think I'm moving to Arizona, my husband refuses but I may just have to go without him, he can always come visit me........oh wait, he doesn't like the heat, I may have to rethink this whole idea? Okay enough about my issues, what does this have to do with National Parks?.............I have to think for a second, oh yeah, it's getting close to spring so you might start venturing out of your cave that you've been hibernating in for the last few months and explore the outdoors a little. I found an awesome site that you can get information about every National Park in the United States www.nps.gov, search by name, location, activity, topic. It also provides all the details about each park that you need to know before going, hours of operation, fees, accommodations, special events. Great resource if you want to get out and explore other parts of the United States or find parks in your own state that you didn't know existed. Check it out: www.nps.gov. 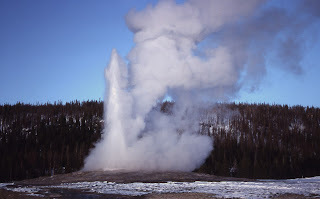 Yellowstone is a great park to visit, I've been there a couple of times, only thing I didn't like was the smell, the sulfur smell is very strong when you are close to the geysers and thermal pools, it's like rotten eggs.